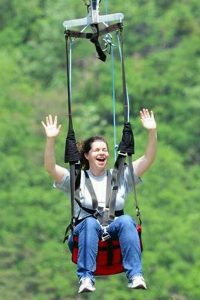 Ziplining at the Arii Hills Skywalk in Jeongseon, Gangwondo, Korea, after the 2016 Annual NET (Native English Teacher) Kickball event. “Despite being successful in school and at work, and even attaining significant financial security, I never hit upon a career that seemed to fit me,” said Susan Zyphur, a 2006 graduate of UCSD. All that changed when she decided to teach English abroad. 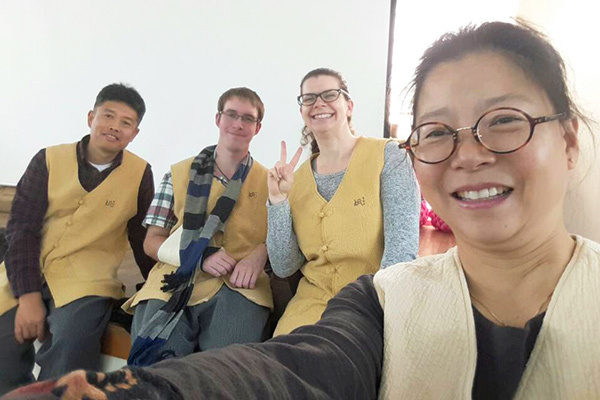 In a Google search, she found the SDSU American Language Institute, and within three months of completing the TESL/TEFL certificate program, was teaching in Korea. She answered a few questions about her journey through the program, and her adventures in Korea and Japan. I received my bachelor’s in psychology from UCSD. I did well in school, but every career I set as a goal never really worked out. My mother had always told me that I should be a teacher because I really enjoyed tutoring, but after seeing the difficulty my sister had in finding a job, not to mention her low salary, I never seriously considered it as a career. I tried studying other subjects at community college to find a career that spoke to me, and also tried working in business in various fields. Why did you choose the TESL/TEFL Certificate program at SDSU’s American Language Institute? I knew that I wanted to attend physical classes for my certificate and looked for a program that would provide in-class teaching experience. I had originally planned to enroll in UCSD’s certificate program, but after attending their open house I knew that it wasn’t for me. I did a Google search and found SDSU’s ALI program, and after emailing and meeting with Jason [Greeno, teacher training assistant director], I knew that SDSU’s ALI program would be perfect for me. The people I spoke with were friendly and liked their jobs, the students I met were happy to be there, the program could accommodate my full-time work schedule, and I could be teaching within a few months — there were no downsides! I attended the evening program and finished in about 3 months. 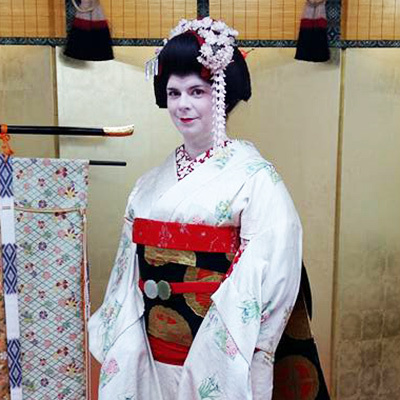 Zyphur getting the maiko/geisha experience in Kyoto, Japan. How did the program’s free worldwide job placement assistance work? It proved very helpful for me. Allan [Pascua, teacher training assistant] provided me with the necessary documents to apply for the English program in Korea (EPiK). After teaching for a year in Korea, I found a job in Japan thanks to a job notification email from Jason. Just prior to returning home, I received another job notification email from Jason about a position in San Diego, and am now working at that school. I completed the program in November 2015 and left for Korea in mid-February 2016. Being new to teaching, I wasn’t sure if I’d want to do it for more than a year. So, I wanted my first contract to be in a country that paid well, provided benefits and housing, and would pay for my flight to and from the country. I also wanted to work for a program with a good reputation so I wouldn’t worry about losing my job for reasons such as funding, etc. Korea’s government-sponsored EPiK was a good fit. Plus, I was looking forward to experiencing a culture that’s very different from my own. I lived in a tiny village in Gangwon-do in Korea, about 90 minutes from the North Korean border. In Japan, I lived in the city of Koriyama, in Fukushima province. Templestay (sampling temple life) in Korea with foreign and native Korean friends. In Korea I taught elementary and middle school students at several schools, and I went to a different school every day. But I never taught more than 20 “teaching hours” (40–45 minute blocks) per week, and no more than 40 hours per week (teaching hours + office hours). In Japan I taught ages 2–12, with 40 hours per week of actual teaching (preparation was done on my own time). I taught 2–4 year olds two mornings per week for 3 hours, and always taught ages 5–12 in the afternoons. One day a week I went to a local kindergarten and taught 3 different classes in the morning, and two days a week I had private lessons in the evenings. My weekends were always free. Yes! In Japan I worked with teachers from South Africa and the Netherlands. I was the only instructor at my schools in Korea, but there was another teacher in my village who taught at a few local elementary schools. He was from Canada. I honestly can’t list all of the crazy, funny, interesting things that happened to me in Korea. It was an incredible experience and the culture is very different. For the most part, my experiences were good and the people were very friendly and kind. In Japan, I found the culture to be unique but more Western than Korea, so it felt a little more like home. 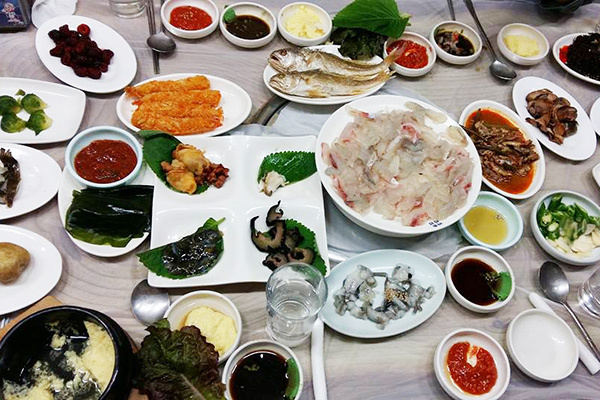 What dinner looks like in Korea. I miss Korean food a lot! I’ll never forget the mudfish soup a local restaurant made — it doesn’t sound very appetizing, but it was delicious! I like spicy food so I adapted very easily to the food there. Unfortunately, I had a bad sushi experience in the U.S. years ago, so I’m not a big sushi fan. But I love onigiri (rice balls), and I have to say that the Japanese really know how to make good desserts. You can buy delicious eclairs everywhere, including every convenience store. I miss milk pudding, it was my favorite! Asha the Korean cat, now a U.S. citizen. I made incredible friendships in Korea that will stay with me forever. The other teacher who lived in my village became like my little brother, and we still talk. The Korean teachers that I worked with, and the Korean friends that I made, all have an open invitation to come stay with me in San Diego. They also became valuable resources when I applied to graduate school — all of my letters of recommendation came from my Korean coworkers. I even made a very unique friendship that followed me to Japan and then back to the U.S. — my cat, Asha, was born on a farm next to one of my schools in Korea. I also really valued my co-workers in Japan, who I still talk to, but I didn’t have as much time for socializing while I was there. How long were you abroad? I lived in Korea for a year and then in Japan for a year. I’m back in San Diego for graduate school (I’ll be studying TESOL), and I’m working at an English school in Little Italy called Q International School. I love getting paid to do something I enjoy! Autumn foliage in Injegun, Gangwondo, Korea. What do you think are the biggest strengths of SDSU’s TESL/TEFL Certificate program? The fact that all of the instruction is in-class makes a big difference; I was better prepared and had fewer problems because of it. The instructors are experienced and knowledgeable, and they can answer any questions you might have about the material you’re learning or the experience of teaching abroad. The evening program was also a huge factor in choosing SDSU’s ALI because I was working full time and my work schedule wasn’t very flexible. But the biggest benefit for me was the in-class experience requirement — learning by doing, with real students. My mentor, Delicia, [Navarette, ALI instructor] was very helpful and supportive, and I learned a lot from her. My life changed a lot after completing the program, and although my experiences abroad weren’t always fun, they were always interesting. I’ve grown so much as a person as a result of living and working abroad, and I’ve finally found a career that I feel passionate about. I owe part of that to Jason, Allan, and the other ALI instructors for helping to prepare me to be a great EFL teacher.